In my world at the moment, the headline news of any day is Lilian's waking smile. That girl. Oh my goodness. I am mesmerised by the emerging personality of this tiny person. I had no idea (for some reason) that a 12-week old baby could be this vibrant of a little soul. This girl o' mine charms me with her whole-body grins, her gurgled conversations, her intense, blue-eyed stare (I like to think she has my eyes because otherwise everyone says she looks like Thomas). I'm slightly besotted in the healthiest possible way. Lilian is sleeping at the moment, however, and I am itching to get back to writing here so I'm snatching this dusky, rain-lit afternoon minute to get back in the saddle and say hello to you friends with a few points of enjoyable news. 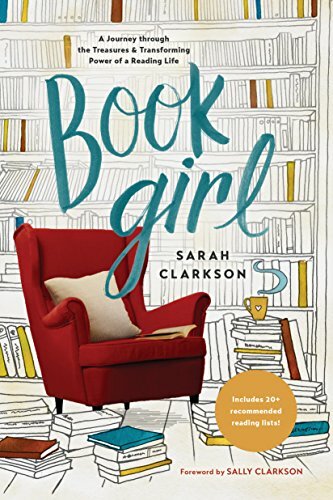 First, I'm tickled to let you know that Book Girl is now available for pre-order at Amazon and other outlets. I'm so eager to launch this book on its journey into the reading world. It's a heart of my heart book. I wrote and rewrote the essays, combed the book lists, restructured the whole thing after I submitted the first draft. I wrestled with this manuscript, laboured with it really, because it was a message, a story rooted in some of the best gifts of love I've known, the truest wisdom I've found. It's finally ready. I think I'll be able to share a few tastes of it soon, so keep an eye here for a snippet or two in the next few months. And if you, as so many other lovely readers have done, wish to join the launch team, drop me an email through the contact form and I'll add you to the list. Second, I take a slightly starry-eyed delight in letting you know that I'll be giving a talk on Tolkien and theodicy at the Wycliffe Summer School here in Oxford in June. It's my first time to present on any aspect of my theological work and oh my. I'm excited. You'll be hearing more about what I've been working on in the whole arena of theodicy (i.e., the problem of evil when God is so good) anyway as I think I'm finally beginning to have space to write about it more creatively. I have some questions to ask you all and thoughts to test. But here's a video about the conference for now, just for fun. Third, on a slightly less auspicious note, but no less enjoyable to me, the curious amongst you will find that I have finally fleshed out my Photography page. It's nothing fancy and I'm not professional. But I've glimpsed so much beauty in my past traveling years and I think one of the gifts we can give each other in this life is a continual reminder of how very good life can be - in snatched, luminescent moments - because that beauty teaches us to hope toward the healed world that's coming. I've uploaded several galleries from some of my favourite adventures, and you'll find that I've added a suggested soundtrack to accompany each set of images. Because I like to think that there's a sort of soundtrack to life. More coming soon. Enjoy. For now, the bird's are chirruping their evening song and the rainy day is drawing down to the darkling hour and I want to take Lilian for a quick stroll before dusk sets in. So I'll bid you farewell for the moment.